Do not keep the engine at full throttle during engine cranking. Keep the engine idling till the oil pressure builds up. Don't allow the engine to be idle for long periods. Don't come down the gradient in top gear. Always change into a lower gear. Don't run the vehicle without a battery in its electrical circuit, as the life of alternator will be reduced. Do not mask head lamp lens (top 1/3 or top 1/2 portions) with black paint. If done, this will reduce head lamp light intensity. Don't use any other than approved brands/grades of fuels and lubricants. 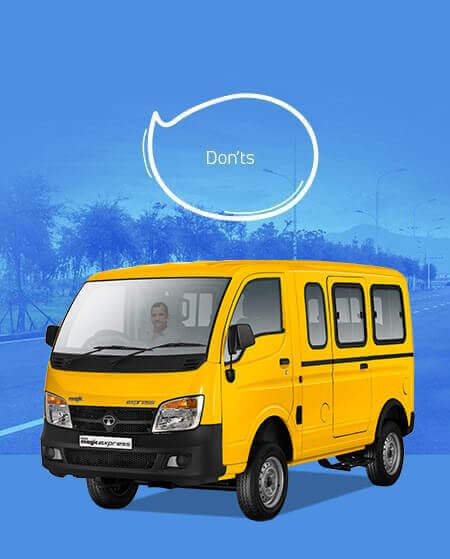 Don't tamper with any adjustment made by Tata Motors dealerships and workshops. Don't try to repair any part of the engine when it is running. Don't attempt to start the engine unless the fault detected is rectified. Do not overfill engine oil in sump. This may cause engine smoking and high engine oil consumption. Do not clean exposed painted surface or wind screen with petroleum products, such as diesel, kerosene and petrol. Don't fit bigger size tyres. Do not over or under inflate tyres. This reduces tyre life. Do not flash the alternator leads to check for current flow. Don't mix two brands of lubricants. Don't open the radiator cap when engine is hot.